Want to get verified on Twitter? That little blue check-mark next to a Twitter handle has long been held in high esteem and can extra authority and prominence to your account. If you don’t know what a blue checkmark is, it’s basically an icon that shows that the account is authentic and truly represents the person(s) associated with the account. A Facebook/Instagram/Twitter verified account badge is always placed next to the account name and is only applied by the platform itself. What’s usual is that verified Twitter accounts are people or brands in the fields of music, acting, fashion, politics, journalism, media, sports, business and other key interest areas. Basically, you have to be a public figure of sorts to get verified on Twitter. But what exactly is a public figure? A public figure is someone who gets recognized by the media as an important person or expert in their industry. These are not one line quotes or mentions you give to the local newspaper, even if it is The Guardian. Nor are they interviews, where your answers are being documented word for word. Nor are they podcasts or radio shows that you end up on, no matter how popular the host is. So the first thing you’ll want to do is to make sure that your information is up to date. Your birthday, email address, phone number, website link must be all in check. Twitter won’t deem you eligible for verification if you don’t have this information in place. Then, go to the Verified account on Twitter and its username is @verified then you click on the link that’s in the URL section of the account. Once you click on the link and go past the next screen, you’re going to see your username filled in. Click on the checkbox, followed by ‘next’. 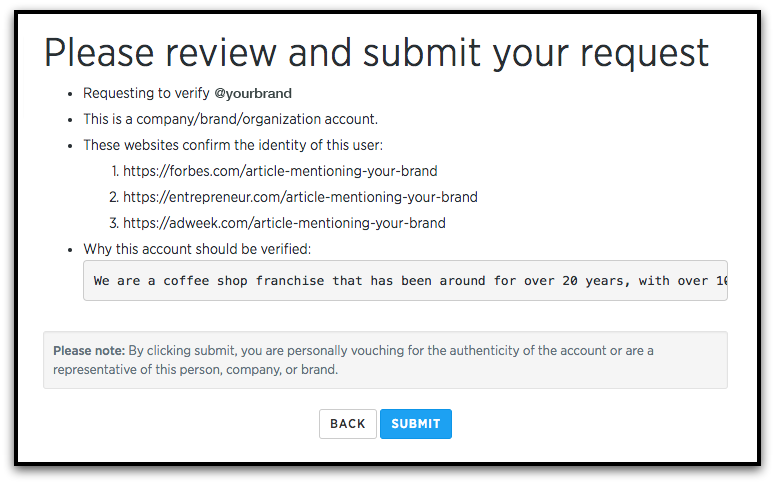 This part is very important: to get verified on Twitter, their system allows you to submit up to five URLs in order for them to verify that you’re an owner of a website, or you’re a staff member, or that you had some sort of presence online. As aforementioned, it’s intensely crucial that you position yourself as being someone of importance. Twitter is not going to go ahead and verify you just because you’re active on social media, so this is really where you have to build your case and be very selective with what you share with them. Besides the five links you submit, you’ll be allotted 500 characters to state that case and let Twitter know why you’re applying for the check-mark and why they should accept that request. Don’t try to include any additional links in this section, otherwise, you won’t be able to click next. The last section at the end of this page would be to add a photo ID. Some people would submit their driver’s license or their passport, so they could go ahead and see through a government-issued ID that the same person requesting verification is the same person that has a Twitter account. Once you’ve completed this form you’ll be directed to another confirmation page. Verify that the information is correct and supports the list of reasons you provided for why you should be verified. If you’re approved you’ll receive a confirmation stating that your account has been verified. There’s a couple of things you have to take in mind: In the bio of your Twitter account, make sure that you have the URL link to the website. Another note is that this approving process could take weeks, if not months. It all depends on how backed up Twitter’s verification system is. Hearing nothing back means that your application is still pending. You’ll know you’re verified when the @verified account follows you on Twitter. You’ll also receive an email from Twitter’s support team if your request is rejected explaining why. One of the main benefits of getting verified is that it boasts personal branding. Moreover, with the verified badge, you can have lots of perks including accountability and stability, definitive access to more specialized Twitter analytics, trust amongst the community, extra security, avoid identity theft, helps you network with others, new followers and much more. This is an interesting perk of verification because it only works as long as people consider Twitter to be an authority. In the past, verification has been solely at the discretion of Twitter. You couldn’t request it or really do anything to attract it besides grow as a person or as a brand, to the point where people notice you, and then to the point where Twitter notices you. This meant that verified users were all verified through direct notice and intervention on the part of Twitter themselves but now everything changed as Twitter opened their request forms to anyone. So in order to distinguish these fake accounts from the real ones, having the blue checkmark is a necessity for yourself and your business. Signals of high authority and authenticity. After all, 85% of customers buy products and patronize services from brands they trust. While some sceptical users will decry the value of verification, the fact is that it’s still a valuable source of authority amongst the average user. Most people are learned in the arcane ways of marketing. All they know is that some people have a blue checkmark and others don’t and that having one is a good, rare thing. It’s much the same way that a lot of people know that earning a Medal of Honor in the military is a high accolade, but they don’t know anything more specific about it than that. You don’t need to know the ins and outs of Twitter marketing or the details of earning verification in order to understand that having it bestowed upon you by Twitter themselves means you have passed some kind of test of worth. Twitter is a great place to build thought leadership, and a blue verification check mark generally correlates to easily build more followers. Impersonation on Twitter can range from the benign parody account to the malicious phishing attempt, and it’s the latter that are the worst for businesses to deal with. When someone sets up a profile with your information copied from your profile, there’s very little way for users to determine which is the real account. They can look at the recent tweets, the account creation date, and the interaction history, but that only goes so far. Influencer marketing is the Next Big Thing on the web right now, and it means people with authority are in high demand. Those people know it, though, and tend to be selective with who they engage with on a deep basis. Superficial responses are par for the course, but if you want them to recognize you or open up deeper options for a relationship in business, you need to stand out from the crowd. One such way to stand out is to be verified yourself. When an influencer sees an incoming message, they’re likely to look for reasons to ignore it. If it’s from someone who is verified, they’re going to give it more attention than they otherwise might. In the past, the process for how to get verified on Twitter was difficult. Now, Twitter made it possible to request verification—all you need to do is make sure you have followed some steps carefully before applying.